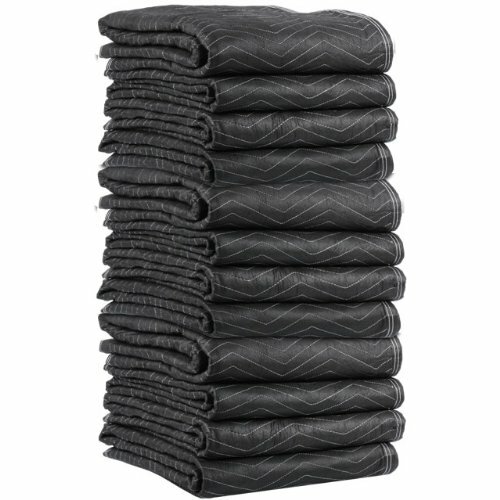 72'' X 80'' Moving Blanket (12-Pack) US Cargo Control Econo Deluxe (65 Lbs/Dozen, Black/Gray) by US Cargo Control at N Online Agency. MPN: MBDELUXE65-12PK. Hurry! Limited time offer. Offer valid only while supplies last. Moving blankets are extremely important for shipping and cargo companies, furniture movers, or any other transporter of valuable or breakable items. View More In Moving Blankets. Moving blankets are extremely important for shipping and cargo companies, furniture movers, or any other transporter of valuable or breakable items. When using tie down straps, it is crucial that you use a moving blanket to protect your goods from scratching or breaking. For an individual doing a home move, moving blankets are useful for covering and protecting large valuable items during transport or storage. Unlike cheap paper moving pads, moving blankets do not tear during transit, and can be used time and time again. There are three factors to consider when purchasing a moving blanket or pad - weight, binding, and whether the fabric is woven or non-woven. At 5.5 lbs. each, the Econo Deluxe is our heaviest economy blanket. It is made with a cotton batting that is thicker, more durable, and more resilient than any other budget moving blanket on the market. Constructed of a strong, non-woven fabric, with 3'' cloth binding on all 4 sides and 4 finished corners, the Econo Deluxe is a high quality moving pad for a low price. Scuffs, scratches and deformations to your valuable items can be avoided by protecting them with moving blankets. U.S. Cargo Control offers a wide selection of the highest quality moving blankets on the market for a great price!